The Kirkwood-Cohansey aquifer system is an important source of present and future water supply in southern New Jersey. Because this unconfined aquifer system also supports sensitive wetland and aquatic habitats within the New Jersey Pinelands (Pinelands), water managers and policy makers need up-to-date information, data, and projections that show the effects of potential increases in groundwater withdrawals on these habitats. Finite-difference groundwater flow models (MODFLOW) were constructed for three drainage basins (McDonalds Branch Basin, 14.3 square kilometers (km2); Morses Mill Stream Basin, 21.63 km2; and Albertson Brook Basin, 52.27 km2) to estimate the effects of potential increases in groundwater withdrawals on water levels and the base-flow portion of streamflow, in wetland and aquatic habitats. Three models were constructed for each drainage basin: a transient model consisting of twenty-four 1-month stress periods (October 2004 through September 2006); a transient model to simulate the 5- to 10-day aquifer tests that were performed as part of the study; and a high-resolution, steady-state model used to assess long-term effects of increased groundwater withdrawals on water levels in wetlands and on base flow. All models were constructed with the same eight-layer structure. The smallest horizontal cell dimensions among the three model areas were 150 meters (m) for the 24-month transient models, 10 m for the steady-state models, and 3 m for the transient aquifer-test models. Boundary flows of particular interest to this study and represented separately are those for wetlands, streams, and evapotranspiration. The final variables calibrated from both transient models were then used in steady-state models to assess the long-term effects of increased groundwater withdrawals on water levels in wetlands and on base flow. Results of aquifer tests conducted in the three study areas illustrate the effects of withdrawals on water levels in wetlands and on base flow. Pumping stresses at aquifer-test sites resulted in measurable drawdown in each observation well installed for the tests. The magnitude of drawdown in shallow wetland observation wells at the end of pumping ranged from 5.5 to 16.7 centimeters (cm). The stresses induced by the respective tests reduced the flow of the smallest stream (McDonalds Branch) by 75 percent and slightly reduced flow in a side channel of Morses Mill Stream, but did not measurably affect the flow of Morses Mill Stream or Albertson Brook. Results of aquifer-test simulations were used to refine the estimates of hydraulic properties used in the models and to confirm the ability of the model to replicate observed hydrologic responses to pumping. Steady-state sensitivity simulation results for a variety of single well locations and depths were used to define overall “best-case” (smallest effect on wetland water levels and base flow) and “worst-case” (greatest effect on wetland water levels and base flow) groundwater withdrawal configurations. “Best-case” configurations are those for which the extent of the wetland areas within a 1-kilometer (km) radius of the withdrawal well is minimized, the well is located at least 100 m and as far from wetland boundaries as possible, and the withdrawal is from a deep well (50–90 m deep). “Worst-case” configurations are those for which the extent of wetlands within a 1-km radius of the withdrawal well is maximized, the well is located at least 100 m from a wetland boundary, and the withdrawal is from a relatively shallow well (30–67 m deep). “Best-” and “worst-case” simulations were applied by locating hypothetical wells across the study areas and assigning groundwater withdrawals so that the sum of the withdrawals for the basin is equal to 5, 10, 15, and 30 percent of overall recharge. The results were compared to the results of simulations of no groundwater withdrawals. Results for withdrawals of 5 percent of recharge show that the area of wetland water-level decline that exceeded 15 cm was as much as 1.5 percent of the total wetland area for the “best-case” simulations and as much as 9.7 percent of the total wetland area for the “worst-case” simulations. For the same withdrawals, base-flow reduction was as much as 5.1 percent for the “best-case” simulations and as much as 8.6 percent for the “worst-case” simulations. Results for withdrawals of 30 percent of recharge show that the area of wetland water-level decline that exceeded 15 cm was as much as 70 percent of the total wetland area for the “best-case” simulations and as much as 84 percent of the total wetland area for the “worst-case” simulations. For the same withdrawals, base-flow reduction was as much as 30 percent for the “best-case” simulations and as much as 51 percent for the “worst-case” simulations. Results for withdrawals of 10 and 15 percent of recharge show decreased water levels and base flow that are intermediate between those simulated for 5 and 30 percent of recharge. Several approaches for applying the results of this study to other parts of the Pinelands were explored. An analytical-modeling technique based on the Thiem equation and image-well theory was developed to estimate local drawdown distributions resulting from withdrawals in other areas within the Pinelands. Results of example applications of this technique were compared with those of the numerical simulations used in this study and were shown to be useful. Differences among the three basins in the simulated percentage of basin wetlands affected by drawdown were found to be related to the proximity of wetlands to streams, the proximity of wetlands to pumped wells, and the vertical conductance of the aquifer system. These factors formed the basis for an index of wetland vulnerability to drawdown. An empirically-derived model based on the Gompertz function and the wetland vulnerability index was developed, tested, and shown to be an effective means to evaluate potential drawdown in wetlands at a basin scale throughout the Pinelands. Base-flow reduction can be estimated from generalized results of the numerical models, estimates of evapotranspiration reduction, or available regional groundwater flow models. These approaches could be used to evaluate alternative water-supply strategies and, in conjunction with ecological-modeling results, to determine maximum basin withdrawal rates within the limits of acceptable ecological change. 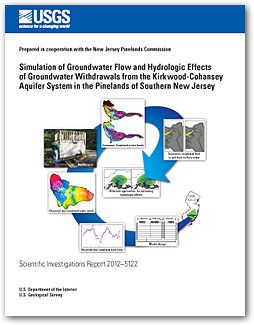 Charles, E.G., and Nicholson, R.S., 2012, Simulation of groundwater flow and hydrologic effects of groundwater withdrawals from the Kirkwood-Cohansey aquifer system in the Pinelands of southern New Jersey: U.S. Geological Survey Scientific Investigations Report 2012–5122, 219 p., available only at http://pubs.usgs.gov/sir/2012/5122/.